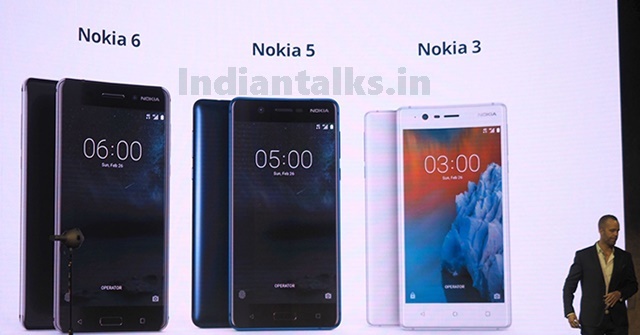 Nokia 6, Nokia 5, Nokia 3 launching in India: The Nokia Corporation is confirmed to launch its latest Android smartphones—Nokia 6, 5 and 3 in India on June 13, 2017. HMD Global, which owns the rights to market Nokia branded phones, had sent out press invites earlier this month for a Nokia event on June 13, but never confirmed what it would be about. Late last week, the firm confirmed the event has been set to unveil the much-awaited Android-powered Nokia smartphones to the Indian market.According to a report by Nokia power users, the Nokia 3 could have a price tag of Rs 9,000; Nokia 5 will be around Rs 12,000 and Nokia 6 may cost Rs 15,000.All of the Nokia smartphones run on the latest version of Android Nougat 7.1.1. Once launched. Nokia 6 features a 5.5-inch (1920 x 1080) display, powered by Qualcomm Snapdragon 430 SoC, coupled with 3GB RAM and 32GB storage, which can further be expanded via microSD card, a 16MP rear camera and an 8MP front camera. The Nokia 6 could be available for approximately Rs 16,000. Nokia 5 features a 5.3-inch HD display protected by Corning Gorilla Glass, runs on Qualcomm’s Snapdragon 430 processor and Adreno 505 GPU, coupled with 2GB RAM and have 16GB storage option, 13MP rear camera, and an 8MP front camera. Available in four colors – Matte Black, Silver, Tempered Blue, and Copper– the Nokia 5 could retail at a price of approximately Rs 13,300. Nokia 3 features a 5-inch display protected by Corning Gorilla Glass, powered by MediaTek MTK 6737, coupled with 2GB RAM and 16GB storage. The front and rear camera have both 8MP sensors. The device will feature four colours—Silver White, Matte Black, Tempered Blue and Copper White It could be price around Rs 9,000. The Nokia announced last year that it had licensed Finnish company HMD Global to produce Nokia-branded mobile phones and tablets.HMD Global has reached agreements with both Microsoft and Nokia for the use of the Nokia brand and some design rights. HMD is planning to spend some 400 million euros on marketing the Nokia brand for the next three years.